The discovery of mutations on the BRCA genes has prompted many women to take drastic preventative measures, including Angelina Jolie and Sharon Osbourne, who sought double mastectomies when it was confirmed they had thebreast cancer gene. Now, a new study, published in Cancer Epidemiology, Biomarkers & Prevention, challenges the belief that a woman from a BRCA family who tests negative for her family-specific BRCA mutation has the same chances of contracting the disease as someone in the general population. He believes there are other genetic factors that may increase the risk of breast cancer. “It is likely that these women inherit genetic factors other than BRCA-related genes that increase their breast cancer risk,” Dr. Evans continues. Dr. Evans and his team analyzed data collected for the M6-Inherited Cancer in England study, which has screened families of people with breast and/or ovarian cancer for BRCA1 and BRCA2 mutations since 1996. From the details, the researchers identified 807 BRCA families, including information about whether or not relatives had been tested. Using this data, researchers found that 49 women who had tested negative for the BRCA mutation had subsequently developed breast cancer. 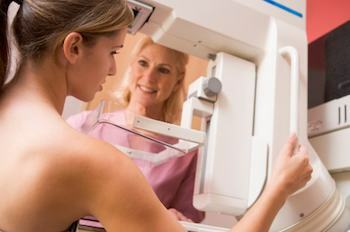 Even when the researchers factored in age, they found that in each age group, there were about twice as many cases of breast cancer as would be expected within the general population. Of the 49 women, 22 were among 279 women who tested negative from BRCA1 families, and 27 were among the 251 women who tested negative to BRCA2 mutations. The study authors then conducted risk analysis, calculating the “observed versus expected ratio” (O/E), the risk of breast cancer in BRCA-negative women from BRCA families, compared with the expected risk in the general population. They found that the women from BRCA1 families did not experience any increased risk, but the O/E for women from BRCA2 families was 4.57 – leading to the conclusion that BRCA-negative women from BRCA2 families face a fourfold increased risk of developing breast cancer. When asked what women who had tested negative previously should do now, Dr. Evans told Medical News Today that if there is a strong family history of breast cancer in a BRCA 2 family, for example with a mother and sister diagnosed under 50, they should seek additional screening. Medical News Today reported that levels of female hormones may explain the increased cancer risk among BRCA carriers.